For when you have a ton of ripe peaches and are feeling particularly too lazy to cook. If you’ve been here for a while, you know that I like to look back on my past habits to analyze, see what patterns there are and see how I can improve myself. I’ve been struggling with a lot of eczema and anxiety/stress-related things lately and I’ve had to really think hard at my current lifestyle and assess if I’m doing what’s actually good for my body. Vegan food aside—I definitely consume a lot more processed food than I should. During my 6-8 week period of the worst of my eczema, I could barely handle cooking, let alone washing dishes or cutting wet, washed produce. I felt incapable and helpless at the very skills with which I find my self-worth. Cooking good, delicious food in my safe place was no longer much of a possibility when I could barely move my hands. So I ate a lot of vegan boxed mac and cheese and ramen. Trying to supplement with as many greens and other veggies as I could throw in painlessly, but even that was quite the feat. I’ve been making an effort to drink more water, actually take the turmeric pills my mom has been pestering me to take daily, eating less processed food (although I do realize that the vegan fish in this recipe is processed), reducing the amount of oil and foods I’m sensitive to so I can give my immune system somewhat of a break. There have been a lot of stressful elements in my life so far and I’ve been doing my best to tame them without having them overwhelm me into a fit of stress-scratching. After endless days of staring at blue screens and endless clicking and typing, this past weekend I dragged Eddie out of the apartment to go on a hike to Crawford Lake. I forgot how satisfying it is to trek between the tree roots and hear the sound of leaves rustling in the woods. The water was calm, the sun was kind, the lack of honking horns and sirens was wonderful. We forget sometimes, that we need to rejuvenate with the gentle energy of nature. It reconnects us and reminds us that we are not naturally supposed to sit at a desk all day. But alas, bills need to be paid. Work needs to get done, and the clicking and sitting resumes. But the quiet call of the trees pulls me back and I crave the feeling of twigs giving beneath my feet and the earthy smell of forest again. This time I won’t wait for the stress scratching and anxiety to push me back into the woods. I’ll try to be more preventative, and less reactive. In the meantime, when you’re busy and you have a pair of ripe peaches that need to be eaten, make this peach salsa. I’ve used it on avocado toast and a burger so far and both were delicious. 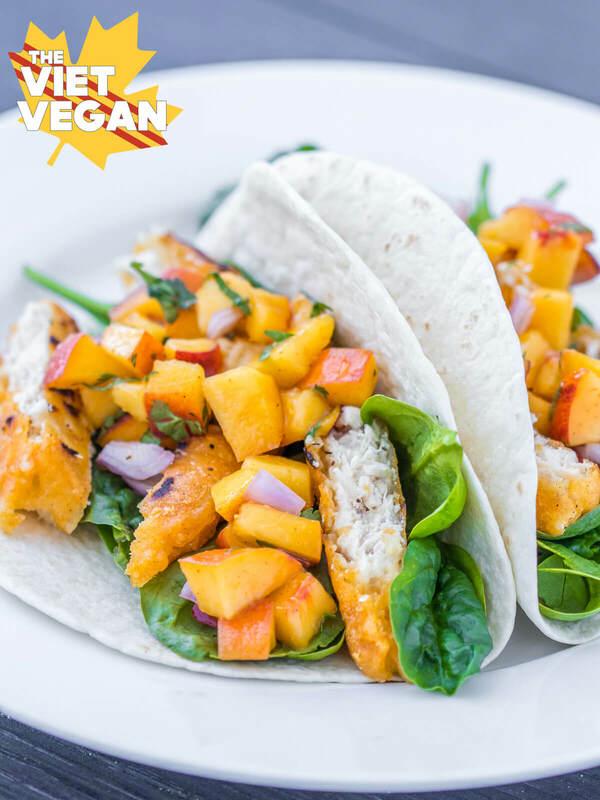 But it’s an incredibly easy way to brighten up tacos or a grain bowl with peachy sunshine. 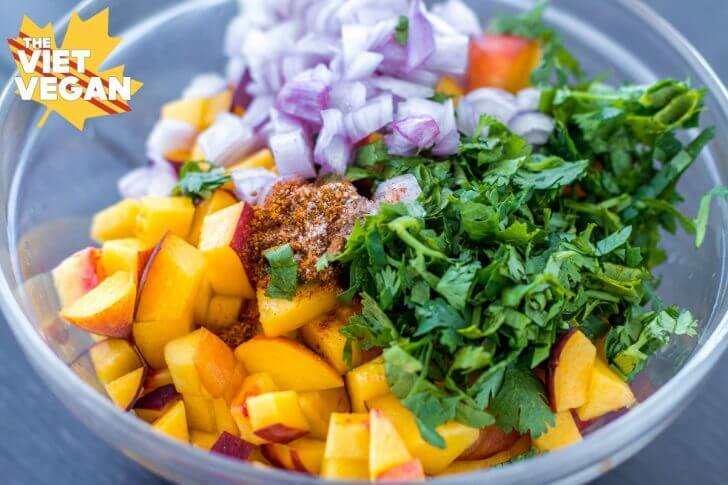 To make the salsa, combine diced peaches, chopped cilantro, shallot, lime juice, olive oil, Old Bay seasoning, 1/4 tsp salt and cayenne pepper powder. Stir to combine and taste. Adjust salt levels as desired. Assemble the tacos by layering spinach and sliced fishless filets. Squeeze some lime on top of the fish for extra flavour. 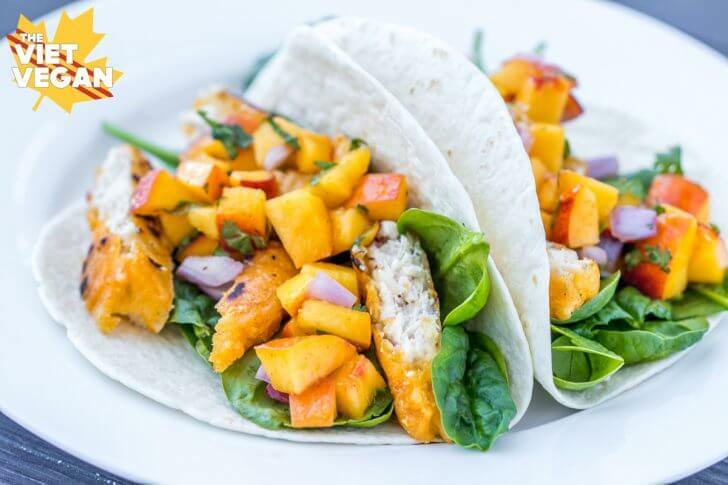 Add a generous amount of peach salsa on top, and enjoy! I have struggled with psoriasis all my life. Since I went vegan and started eating clean, unprocessed, fatty foods it has healed up tremendously! a nice homage to SoCal! and grilled pineapple works well for the salsa too.